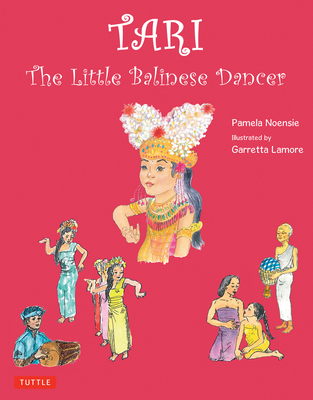 This colorfully illustrated multicultural children's book presents a touching story about a little girl and her love of Balinese dance. Tari lives on the beautiful island of Bali with her family and friends. She lives a wonderful life, marked by all the things that make Bali special--the lively temple celebrations which occur regularly in her village, the gorgeous sufroundings, the warm feelings of her Balinese neighbors, and, most importantly, dance. Tari lives to dance. Just like her beloved grandmother, dance exists for both of them as a favorite art form. One day, Tari's grandmother gives her a special gift--but shortly after, she passes away. In a special ceremony, Tari and her family bid goodbye to her grandmother. Tari gives her grandmother the best gift she knows how to give--a perfect performance of a dance that her grandmother, too, performed when she was very young. Intended for young girls who love to dance, Tari: The Little Balinese Dancer is a moving tale set on the tropical island of Bali, and it provides an excellent introduction to key aspects of Balinese culture. No matter what her ethnicity, young girls will easily relate to the special themes in this story, including the importance of family and the strong bonds of community, traditions such as the famous Legong dance, death of a family member, and the grieving process. Full of traditional Balinese Hindu beliefs, this story offers the message that kids all over the world are unified in the ways they feel about the people and things they love. Pamela Noensie is a scholar in the fields of psychology and communications. She lived in Indonesia for sixteen years, raising her family there, and continues to spend half of her time in Asia. She lives in Larkspur, CA. Garretta Lamore has lived in many countries with her family, including over nine years in Indonesia. Garretta has illustrated several books in the US and overseas. She lives in Crescent City, CA.